A new label and name in 2016, neither of which are shown on SAQ.com (the UPC codes are the same, however). 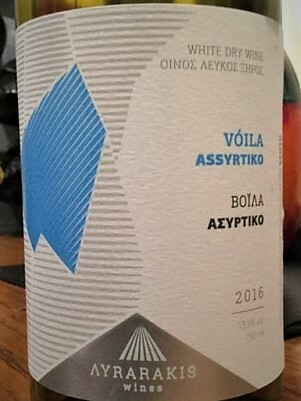 100% Assyrtiko from unirrigated vines planted in the 1970s in the loamy soil of the Vóila vineyard at 580 m in Sitia, eastern Crete. (These may be the first Assytiko vines planted outside Santorini.) Manually harvested. Given 10 hours’ skin contact at 12ºC. Fermentation in stainless steel lasted around three weeks. Reducing sugar: 6.6 g/l. 13.5% ABV. Quebec agent: Focus Cellars.